I went on a reporter ride along last night with a Philadelphia Police Officer assigned to the 3rd District in South Philadelphia. On assignment for The Journal of Counterterrorism & Homeland Security International, I spent the evening with Officer Lynne A. Zirilli. 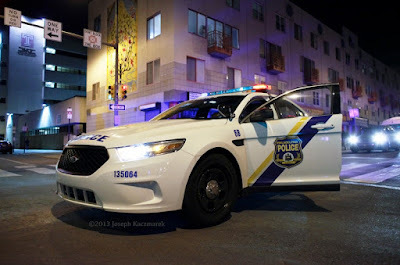 In light of the ambush shooting of Philadelphia Police Officer Jesse Hartnett by a man claiming to have committed attempted murder in support of radical Islam, I'm working on a piece on the inherent danger police officers face while on patrol. Police officers are the first line of defense in the war on terrorism. More than ever, patrol officers need to be vigilant. While out on patrol, they are a highly visible target that attracts violent criminals and terrorists. Patrol officers are tasked, as it states in the Philadelphia Police Department's Mission Statement, to "fight and prevent crime, the fear of crime, and terrorism." Officer Zirilli responded to a good number of calls last night, ranging from a scuffle in a fast food restaurant, to car accidents and armed robberies. I'll post my magazine piece here when it is published.